(CNS): The chances that the country’s voting system will be changed before 2017 now look very slim after the premier revealed on Monday that he will not push through a change without full consensus. Alden McLaughlin wouldn’t reveal how many members of his government were opposed to implementing the system based on the 2012 referendum of 18 SMCs or who they were but pointed the finger at those who did not run on the PPM ticket. 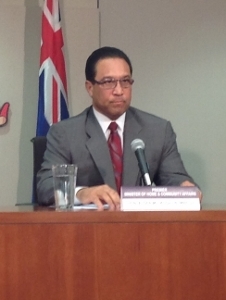 In the face of allegations from Arden McLean and other sources that it is McLaughlin himself who is the most reluctant to move on the changes, the premier said McLean’s motion was about trying to bring down his government and not the voting system. Speaking at a press briefing Monday held to discuss an MOU signed with the proposed Ironwood project developers, the premier said that the events on Friday were not “government’s finest hour” but that merely reflected how controversial this issue is. Referring to the situation when the House was tied over the vote on McLean’s motion on OMOV in SMCs because PPM back-benchers Anthony Eden and Al Suckoo voted for it and three Cabinet ministers were absent, as well as the opposition leader, at the time of the vote, he pointed to mistakes made by what he said were novice parliamentarians in the face of a seasoned legislator who knew to round up his speech with haste when he saw the empty seats. He said he believed that the retreat had led to a compromise on the issue that everyone in his government could support but that turned out not to be the case. McLaughlin pointed to a lack of support by some government members for the 18 SMCs, his own concerns about small constituencies and his preference for 'at large' candidates and fewer constituencies, andas a result there would be no change to the electoral system unless it included 'at large' candidates. With the split on the issue inside the PPM as well as the wider government and the need for a new boundary commission to examine and draw up the suggested 15 constituencies, the time to conduct that process and then implement the change means that time could very easily run out before 2017. McLaughlin stated clearly that the voting system would not change unless it had the support of all his government members and he would not try to force anything through that the government members did not all agree on. Despite the U-turn on the election promise and allegations that he had wavered, McLaughlin seemed undeterred as he said keeping his government together to address the pressing issues of the day was more important. The premier stated that it was not just one or two members that were not in favour of the 18 SMCS, and though they were all committed to the issue of voter equality, many government members still have concerns about the potential problems that could be thrown up by too small constituencies, he said. Pointing to his belief that it would be easy for people to get elected on just 250 votes in constituencies that would be made up of about 1000 members, he spoke again of “bizarre results” especially in vulnerable areas of the capital where voters are at the bottom of the socio-economic scale. He also stated that the introduction of ‘at large’ candidates, those who would run on a national ticket, would “mitigate against” what he described as “parochial politics”. McLaughlin also dismissed the allegations made by East End member Arden McLean, who brought the motion, that he had tried to cut a deal with him. McLaughlin said McLean had left the PPM because of the leadership and not because of the issue of SMCs. The premier said that “there was nothing to be gained” by him answering the allegations which were “coloured by his perceptions” about what had happened. He made it clear that he believed that the motion was brought deliberately to undermine government and described it as a “frontal assault” in his and Ezzard Miller’s efforts to bring down the administration “having identified an Achilles heel” in what was an otherwise a solid, unified administration. The premier said his government was not in general divided and he did not believe any of his team were planning to join the opposition benches but this was an issue which was going to be difficult. “Government took a beating … but we have a country to run,” he said, adding that he did not think the voting system was at the forefront of many people’s minds. (CNS): Police, the Fire Service, Port Authority officials, EMS, Tikki Beach and other tourist operators all assisted in the search of a missing child Monday afternoon on Seven Mile Beach who was found some two miles away from where she went missing. An RCIPS spokesperson said that the seven year old girl who was visiting Cayman on a cruise ship the Disney Fantasy with her family went missing as they all walked along the beach at around 2pm today while at Tiki Beach. Heading north with their children the girl’s parents did not realize their 7-year-old daughter had gone astray until they returned to Tiki Beach. The parents raised the alarm when having gone back over the ground they had covered they did not find their daughter. The Police coordinated a search and rescue involving personnel from the RCIPS Marine Unit, the Fire Service, Port Authority,EMS and Life-guards from Tikki Beach. A DJ at Calico Jack’s at the Sea Grape Beach also repeatedly announced the missing girl over the PA to people on the Beach and gave her description. Police walked the beach also announcing the missing girl’s description to people on the Beach and nearby hotels. An hour after the parents raised the alarm at around 3:00 pm the police involved in the search received a call from a guest at Cayman Beach Suites (formerly the Hyatt) who said a young girl fitting the description was on that beach. The RCIPS took the parents to the area wherethey identified their daughter who was united with her parents safe and sound. The RCIPS offered its thank to the Fire Service, Port Authority, EMS, the Tikki Beach’s Lifer Guards and all others who helped in the successful rescue of the young girl. (CNS): The Confederation of North, Central America and Caribbean Association Football (CONCACAF) has formed a new task force to examine the feasibility of a potential Caribbean wide professional football league. The task force will analyse all the possible options for developing a sustainable league structure in the Caribbean, with the objective of improving playing standards and overall professionalism. “I am certain that there are immense untapped opportunities for football in the Caribbean,” said CONCACAF President Jeffrey Webb. We need to evaluate thoroughly how best to convert potential into a viable structure that could create new futures for clubs, players, fans and the game as a whole,” the president added. Don Garber, Commissioner of Major League Soccer is one of the members and he explained the aim of the task force. “Our focus will be to analyse the feasibility of a sustainable business model – one that can serve as the cornerstone to build a league that provides a platform for Caribbean talent, as it develops equity and value in the long term,” he said. As some nations in the Caribbean possess established domestic leagues, the group will review current infrastructures and assess what competitive format would achieve the best outcomes for long-term success. Meanwhile, England’s Premier League will support the process in an advisory capacity and Richard Scudamore, Chief Executive said, “The Premier League is honoured to be one of the special advisers to this task force. We are making our entire executive team available to offer any help we can in realizing the potential for top-class professional football in the Caribbean. The region’s football fans deserve it,” he added. Dr Yves Jean-Bart, President of the Haitian Football Federation, will chair the group which along with Garber and Decio de Maria includes Dr Keith Mitchell the prime minister of Grenada; Edward Seaga the former Prime Minister of Jamaica and Chairman of the Jamaican National Premier League; Damien Hughes who is the general secretary of the Caribbean Football Union; Simon Firth a partner with Maples and Calder in the Cayman Islands; David John Williams the owner and president of W Connection Football Club in Trinidad and Tobago; K.H. Randolph Horton the speaker of the House of Assembly in Bermuda; Randy Harris the President of the Barbados Football Association; James Johnson Senior Manager Member Associations, FIFA; and Shaka Hislop football commentator and former Trinidad & Tobago national team captain. Alongsidethe English premier league Jefferson Slack, the senior vice president, global business development at IMG and Kieran Foley Group Head of Marketing at Digicel will also be special advisors. The task force will hold its first meeting on March 12 in Los Angeles. A previous attempt to institute a Caribbean league began in 1992 when clubs from as far north as Jamaica and south as Guyana competed in the Caribbean Professional Football League. After changing competitive formats and league name over its three seasons of play, the circuit ceased operations before the 1995 season. Cayman Islands Chili Cook-Off is back! (CNS): Cayman’s local brewery is resurrecting a culinary event that was the precursor to the Taste of Cayman but is much missed by local and visiting chili-lovers. CayBrew's Marketing Manager Matthew Leslie says the CayBrew International Chili Cook off is sanctioned by the International Chili Society (ICS) and the winning team will get an all-expense paid trip to one of the finals of the regional competition. There will also be prizes for the second and third placed teams, as well as raffle prizes for people who come to enjoy the festivities and taste some of the delicious chili recipes in the competition. It also coincides with Caybrew’s 7th anniversary on 22 March. “What’s better to extinguish chili with but Caybrew?” Leslie asked. He said they wanted to prove how well they can host this event so that next year, working with the ICS it can become a regional event. As a regional event, the Cayman Islands will compete with the 40 or so countries in the Caribbean and Central America that take part in chili cook offs, such as Jamaica Puerto Rica, the Dominican Republic, Cuba, the Bahamas, and Bermuda. The category is “Home-style chili”, which is very broad. Teams up to four people can enter and the entry fee is $100, which also gets the team registered with ICS. The Caybrew International chili cook off is being hosted on Seven Mile Beach on the land that is directly between the Lone Star Bar And Grill (the location for the original Chili Cook -Off) and Buckingham Plaza – the old entry way to the Hyatt. Gates open on Saturday 22 March from noon until 8pm, and there will be bouncing castles and cotton candy for the kids. Attendees will pay $20, and they will get a wristband and five chili pots to sample the competing chilis. They can also purchase more chili pots to sample more chili. Sponsors include Cayman Airways, the Department of Tourism, Home Gas Ltd, Uncle Bill's and also Red Bull. Hurley’s Supermarket is the official Food Sponsor and all the teams that are registered will get gift certificates to do their shopping for the competition at Hurley’s. The media sponsors for this event are Cayman News Service and CNS Business and attendees can get a “$5 off voucher” by going on either of those websites and printing off one voucher (see attached) for each person coming. Leslie says there will be lots of music, lots of fun and raffle prizes, including Cayman Airways tickets and Home Gas is offering a big prize of a beautiful stove range, plus its installment and propane. To enter or for more information, call 947-6699 or email CaybrewCookoff@cib.ky. (CNS): A 35-year-old George Town man has denied ten counts relating to the theft of thousands of dollars’ worth of gold from a local pawn shop between November 2011 and March 2012. Evon Robinson is alleged to have stolen the gold from Cash Wiz when he was a working as a courier for Federal Express from the packets which were destined for metal refineries in the US. Robinson pleaded not guilty on Friday on all counts when he appeared in Grand Court. A trial date has been set for October and Robinson was released on bail. Although Robinson has not yet been proven to bethe culprit, Cash Wiz filed a law suit against Federal Express last October holding them liable. Robinson was arrested by police and charged following what was described as a lengthy investigation, in which it was alleged that he was taking various quantities of gold from the packets. The missing precious metal came to light as a result of consignment records which showed a disparity between the weight of gold that left Cash Wiz and the weight of gold that arrived in the US on a dozen occasions, the pawn shop claims. (CNS): Women needing to see an obstetrician are being refused appointments, the North Side MLA said in the Legislative Assembly Thursday, asking the health minister to find out what is happening. Even women who have had miscarriages or in danger of losing a baby are not able to make an appointment and are directed to the emergency room, Ezzard Miller said, as he queried the way that the obstetric clinics at the hospital are being operated and managed by the Health Services Authority. “Under the current system if a person walks up to the reception counter of the women’s clinic at the hospitalor telephones to make an appointment to see an obstetrician they are told that is not possible, but to give them a number and a midwife will call to make the appointment,” he said. He said he was raising the issue not on the basis of some secondhand complaint made to him by a constituent but as a result of personal experience in trying to make appointments for women for the specialized treatment. 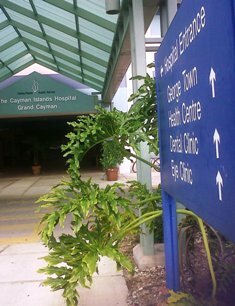 “Standard medical best practice and good business sense mandates that the receptionist or clerk, and there appears to be a one sitting at the desk at the George Town hospital, requires that the receptionist keep a daily appointment book and schedules appointments for the doctors,” he said, adding that patients can then be given an appointment to be seen at a specific available time during normal working hours that is convenient for the potential patient by the receptionist. Miller said he believed the HSA has four obstetricians on full time staff. “This situation is entirely unacceptable and I am asking the minister to correct this situation and insist that the receptionist/clerk make the appointments and that a morning clinic is conducted to facilitate those who work evenings,” he added. Miller also suggested that patients be given the opportunity to choose a specific obstetrician as it would be a good indicator of the quality of service each gives. The health minister was absent from the parliament when Miller queried the appointments issue and he was told by the deputy premier that the health ministry would respond to his query in writing. CNS has contacted the minister and the HSA and is awaiting a response. (CNS): Following his decision to vote in favour of the private member’s motion on 'one man, one vote' (OMOV) in the Legislative Assembly Friday evening, Alva Suckoo has also revealed that the only reason why he voted against the motion regarding minimum wage was because he believed $5 is too low even as a starting point. 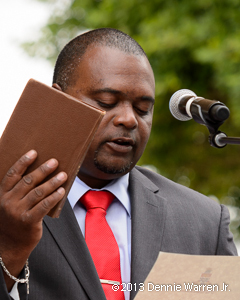 The Bodden Town backbencher said that he supports the minister’s decision to do the research in order to arrive at rate which will make a difference and end the exploitation of cheap labour but he believes that the research should only take weeks, not months, as he called for a speedy implementation. Suckoo told CNS that he had intended to speak on the issue during the debate on the private member’s motion presented by North Side MLA Ezzard Miller last week, which asked government to implement a minimum wage starting at $5 per hour. However, Suckoo said he missed the speaker’s last call. No other member spoke on the issue of a minimum wage last week following the employment minister’s damning criticisms of Miller’s motion and her indication that government would be engaging in considerable research and analysis before it would be considering any basic rate. Although the PPM campaigned in favour of a minimum wage and its implementation as an early priority, Tara Rivers, who was backed by the Coalition for Cayman, is understood to be opposed in principle. Suckoo said, however, that he does believe Cayman needs to introduce a minimum wage as soon as possible. Although he could not agree with the amount recommended in the motion, he said the time had come for its implementation. Cheap labour began replacing Caymanian school leavers when the recession kicked in, resulting in high Caymanian unemployment, he said. He pointed to people living in sub-standard overcrowded housing as a result of the importation of cheap foreign labour and said that the authorities had ignored the social problems this has created. As the son of an immigrant, he said, he also had an interest in seeing that foreign workers are also treated fairly. Suckoo said that a minimum wage would not, as some believe, be inflationary but he said it would achieve a fair, effective and balanced relationship between local and expatriate labour. Hourly rates for some jobs have not moved in decades, despite increases in the cost of living, so anyone who opposes the notion of employee protection is “either blind to the facts or deliberately ignoring them,” he added. “The argument that a minimum wage would put unskilled labourers out of work began to unravel in the 1990’s,” he told CNS. “Studies conducted during that period proved that all things being equal, small increases in minimum wage had no significant impact on employment in the low-skilled population. “As lawmakers, it is our duty to ensure that we set the line below which wages must not fall,” Suckoo said, adding that the government and MLAs needed to demonstrate that they subscribe to a higher moral and ethical standard than those who allow the exploitation of workers within their industries. But with arguments that the wage should be now to set at $5, $7, $8 or even $10 was an indication, Suckoo observed, that the government doesn’t yet have the necessary data and research to make an informed decision. He said he supported the decision to conduct the research but he hoped to see the work completed sooner rather than later so that it would be brought to the LA as quickly as possible for passage. “I haven’t forgotten that a minimum wage was a promise I made on the campaign trail and I remain committed to seeing this done,” he said, but noted that the exercise required precision. The motion brought by Miller had requested government change the labour law to implement a $5 rate as a minimum wage as a starting point, which could be reviewed. But if the country didn’t begin somewhere, it would continue arguing about it for another twenty years, he said. (SSC): Stingray Swim Club (SSC) grabbed the attention of the CIASA Selection Committee and of club rivals CBAC and Team TI at the recent CIASA National Swimming Championships when they walked away with 5 new CIASA records; 12 new National records and 7 new Stingray Club records. Stingray's Head Coach Andy Copley, along with Coach Joanna Manderson, were on deck for the four days of the meet with swimmers ranging in age from 7 to Masters and both were delighted with the team's results. Coach Andy had this to say about the meet. "Our team didn't rest going into this competition, so I wasn't necessarily thinking we were going to get stellar results," he said.
. The kids surprised me though and swam out of their skin. Our little guys and our seniors came together and pulled out huge swims. Some of them were as surprised as I was." "Having 15 kids qualify for CARIFTA is pretty cool but I think it's just a testament to how hard these guys work. I keep telling them to point their aim beyond CARIFTA and they have. For many of them, qualifying for this meet is great, but it's only a step on the path toward qualifying for bigger, more challenging meets like Island Games, CAC Games and Commonwealth Games. I feel good that we're on the right path but there is a long way to go still. Luckily we've got a group of swimmers willing to make the journey." Corey Westerborg (9-10) took down Brett Fraser’s ancient SSC 100 freestyle record in a time of 1:14.22 (Brett Fraser 1:15:52 – 2000) and also took down Brett’s SSC 50 freestyle in a time of 33:17 (Brett Fraser 33:28 – 2000); while Miquela Montana downed Lara Butler’s 11-12 200 breaststroke National Record in a time of 3:08:74 (Lara Butler 3:11:24 – 2007). Other SSC records are at the end of this release. 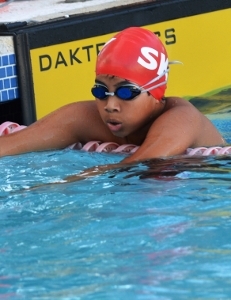 Please note too that CIASA records may be held by swimmers or any nationality as long as he or she is a CIASA member; National records may only be held by Caymanians. Stingray members travelled to Kingston, Jamaica for some long course swimming at the Walter Rogers Age Group National Championships February 27-March 2 – highlights to follow soon; and then it will be back to the Lions Aquatic Centre to prepare for the rest of this year’s competitive season including the Consolidated Water Pete Ribbins Memorial, CARIFTA, the Ernst & Young Summer Burner and the Lions Sprint Meet. For information on Stingray Swim Club visit our website www.caymanswimming.com or email stingraysec@gmail.com . (CNS): A Chicago college VP has been appointed to the top job at the International College of the Cayman Islands (ICCI). Dr David Marshall succeeds Dr Tasha Ebanks-Garcia, who is now the deputy chief officer at the employment ministry. April Cummings, Chair of the Board of Trustees of college. Said the board had voted unanimously on Marshall’s appointment during its February meeting and Marshall began his new job on 1 March. "Dr. Marshall is the right person to lead our College to its next level of achievement,” said Cummings. "His wealth of experience and track record of promoting student success demonstrate his exceptional ability to move our College forward,” she added. Marshall has more than 12 years of experience in higher education. He started as an adjunct professor and has since worked as a full-time professor, an academic department chair, a dean and an assistant vice president. 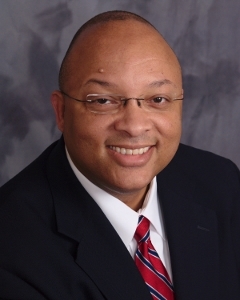 Since 2012, he was Vice President for Academic Affairs at Olive-Harvey College, one of the City Colleges of Chicago. Marshall had oversight of an academic budget of $15 million and supervised 200 employees. Olive-Harvey enrolls over 5,000 students annually. "Dr. Marshall brings a remarkablelevel of enthusiasm and dedication for doing the right thing for students. We were impressed that he presented to us sound ideas about how to improve graduation rates, retention rates, and most important ways to link our educational programs to the needs of employers so that more Caymanians can take their rightful places in business and industry,” Cummings added. Born in Baltimore, Maryland, Marshall holds a Ph.D. in Mass Media and Communication from Temple University, a Master of Journalism, also from Temple, and a BA in Religious Studies from Morgan State University. Since the departure of Ebanks-Garcia, Dr Raymond Hayes served as the interim president. He is the former Chairman of the ICCI Board of Trustees and Secretary for the US-based non-profit organization, Friends of ICCI, which supports the college through fundraising and alumni activities. Founded in 1970, the International College of the Cayman Islands is the birthplace of Higher Education in the Cayman Islands. The College is accredited by the Accrediting Council for Independent Colleges and Schools in Washington, D.C. to award associates, bachelor’s and master’s degrees. The mission of the International College of the Cayman Islands is to prepare students for career placement and enhancement. The ICCI education instils attitudes, behaviours, sensitivities, skills and knowledge that are essential to life and learning. (CNS) Updated: The 46-year-old Canadian man whose body was found on the ocean floor this weekend in around 20 feet of water has been named by police as Timothy Denver Mullin from Etobikoe in Toronto. Police said that Mullin who had arrived in Cayman on Saturday had gone snorkelling alone at around 4pm on Sunday afternoon as his mother with whom he was visiting Cayman had waited on shore. His body was found in the Eden Rock area at around at 5:29pm by divers who were returning from a dive towards Don Foster’s Dive shop in South Church Street. The divers brought the man’s body back to shore and police and Emergency Medical Services responded to the scene. Mullin was taken to hospital where he was pronounced dead at 5.55pm. Police said that enquiries are ongoing into how the man died but that there appears to be no suspicious circumstances surrounding the incident.